The 27.71 metre sailing yacht Solleone, jointly listed for sale by Georges Bourgoignie at Fraser Yachts and Mediterranean Yacht Management, has been sold with Georges Bourgoignie introducing the buyer. 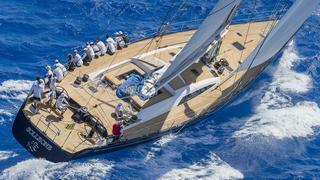 Built in carbon fibre by Nautor’s Swan to a German Frers design, she was delivered in May 2009 as a Swan 90 model. Accommodation is for eight guests in four cabins consisting of an aft master suite, a double amidships and port and starboard twins, all with en suite shower facilities. The aft cockpit is recessed into the deck while the forward cockpit has two U-shaped settees and two varnished teak cockpit tables that can be lowered to seat level to create an expanded sun bathing area. Solleone sports an ultra-clear foredeck, a well-organised area around the foot of the mast, a guest cockpit set behind the low rise of the coachroof and a helm station sunk on a slightly lower deck level further aft. In the saloon, lined with teak panelling, there is a U-shaped settee to port and L-shaped settee to starboard with seating for seven to eight guests. Two identical custom made tables can be raised, lowered and extended, offering dining for up to eight persons. Her performance is exceptional and she is well suited for family cruising with all comfort and safety systems, or for full-on regatta competition. Under power, a Volkswagen TDI V6 engine gives her a cruising speed of 10 knots. A popular charter yacht, she was offered complete with her tender and water toys. Solleone was asking €5.3 million.